Since leaving school, I’ve spent my summers shooting with Johns Hopkins Center for Talented Youth, an accelerated learning program for child prodigies. I always enjoy the month I spend with them because the content is fascinating and I get to dabble in every department. This year in particular, I operated camera, gaffed, and ran audio on three weeks of travel work up the east coast. Most notably, we filmed at an oyster and sturgeon rehabilitation center, then rode the Chesapeake skipjack Sigsbee from Cambridge to Sandy Point. If given the opportunity in the future, I’d love to learn how to crewhand on a sail boat because it was awe-inspiring to watch. My favorite part of the CTY jobs is watching classes so passionate about education that everyone involved, teachers and students, get to nerd out about a specific subject. One of the teachers we followed was formerly a professor of a medical college before becoming a high school science and drama teacher. The diversity of his skillset brought fascinating pedagogical methods to his classroom, including discussing the W.H. Auden poem “Musee des Beaux Arts” and Pieter Brueghel’s “The Fall of Icarus,” as an example of humanity’s apathy towards the suffering of others. These are middle school students taking a “History of Disease” course, mind you. It was incredible to watch. Production continues on “What Happens Next Will Scare You,” the microbudget anthology film I am gaffing and assisting camera on. We finished a segment in August that I am particularly excited about. I can’t give details, but I’ll say that it’s shot like a news package and will be digitally degraded to look like it was videotaped in the 1980s. Multiple times our first night, I would set a frame and then realize that I had to re-frame for 4:3 with a broadcast aesthetic. It was a fun challenge. BTS Photo of the latest WHNWSY segment. 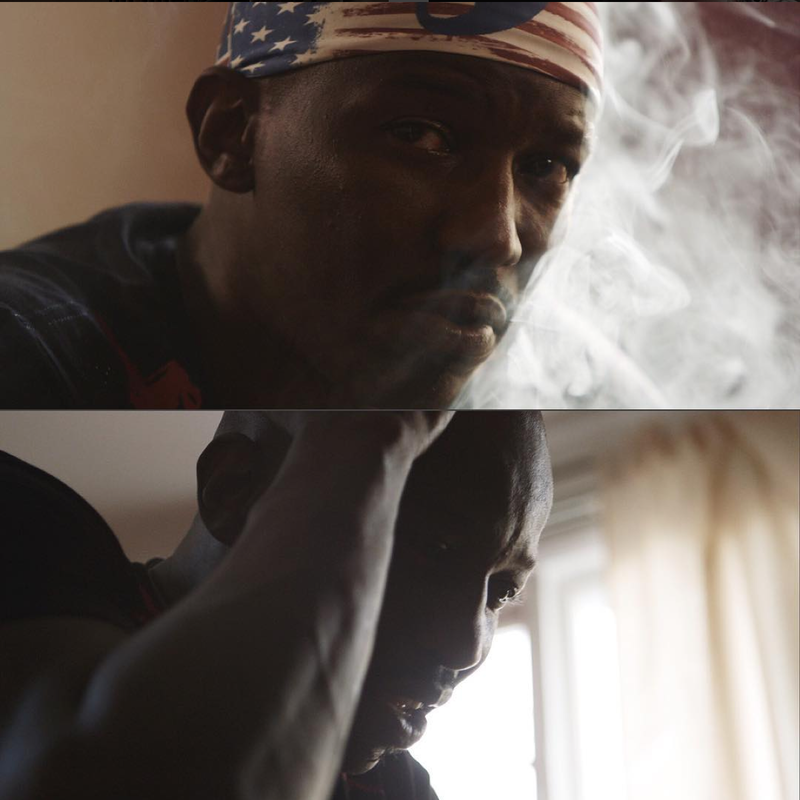 Revolving Doors, a feature documentary about the faults of the national prison system, was shot in Baltimore over the last two years. With this latest round of shooting in mid-August, production has come to an end. The New York crew on the project came down to tie together the pieces of their current edit and I’m excited to say that I they have an amazing film on their hands. When I shot with them last year, I was merely an extra set of hands for their skeleton crew footprint in East Baltimore. However, I struck up a relationship with the director and producer on set and they asked that 2nd Unit DP Kyle Deitz and I watch a rough cut of the film to give notes on. Subject Tard Carter, shot by Kyle Deitz. This year, when they returned to finish out the film, we were again invited to look at the latest cut of the film. This allowed me to suggest future interview questions and edit notes to our director and producer, who openly welcomed the collaboration. I gaffed our interviews and camera assisted for Kyle Deitz on the back half of the film, and I can’t tell you how excited I am to see it premiere. 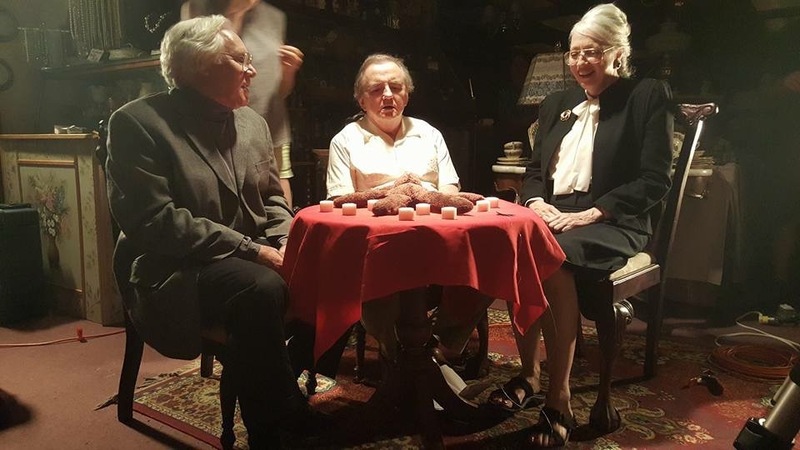 Although my role in the grand scheme of the film is small, I felt an immense contribution to production because of the way our director and producer invited us in to the mix. The documentary process is fascinating, invigorating, and important to me, so any experience in that world further pushes my heart and mind in that direction. It’s what I ultimately want to end up doing, and so I always jump at the chance to flex my departmental skills in documentary. Speaking of which, a new Amazon docu-webseries, tentatively called Human Kinda, came into D.C. a few weeks back. I worked with the DP and production to assemble a package on budget, did a fair amount of run-and-gun doc style shooting, and wrapped out our week with a big, staged lighting scenario. Needless to say, it was a ton of fun and immensely rewarding. I can’t talk much about specifics, but be sure to look for it in the near future! The most surreal experience I’ve had lately was being in a sports bar full of TVs and seeing a commercial I worked on. I worked as a third electrician on a Sportscenter promo featuring the Nationals racing presidents back in August. The content itself was funny, but watching the President mascots goof around in their costumes after hours was hilarious. We had the whole stadium to ourselves overnight, so I and my fellow G&E crew posted up on the first base line to watch the events of the evening. If you’ve never had the opportunity, trust me when I say that it’s a unique experience to see the content you watched live on a director’s monitor projected to a national audience. I hope to never lose that excitement for the work I do. I never expected to find myself on the field of a professional baseball stadium. Literally the only scenario I could anticipate finding me at home plate would be as part of the Make-a-Wish Foundation. 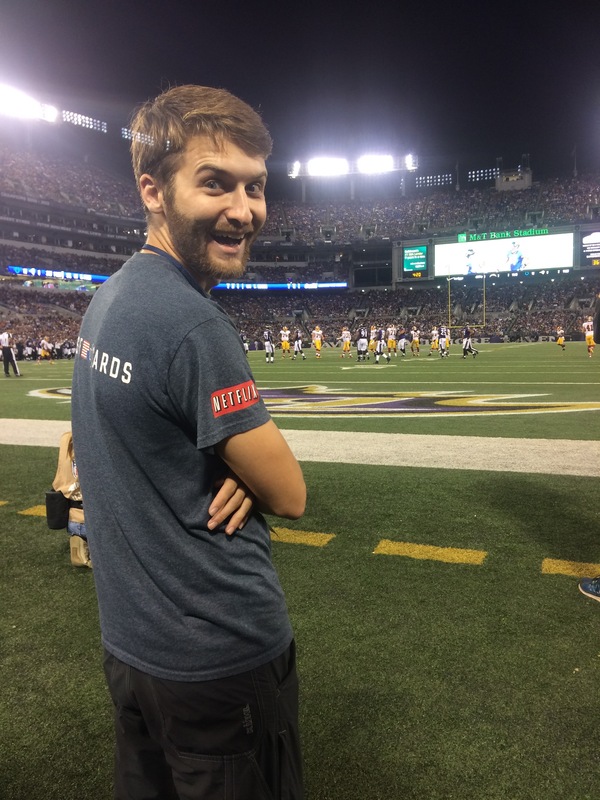 Needless to say, when my girlfriend invited me to camera assist at Raven’s stadium a few weeks later, I jumped at the opportunity. We filmed a youth group’s scrimmage football match during halftime. Our DP took a direct hit from an over-eager tackle the previous week, breaking part of the follow focus, so we were told to be on the defensive. Luckily nothing bad happened, and I walked away with an once-in-a-lifetime experience. 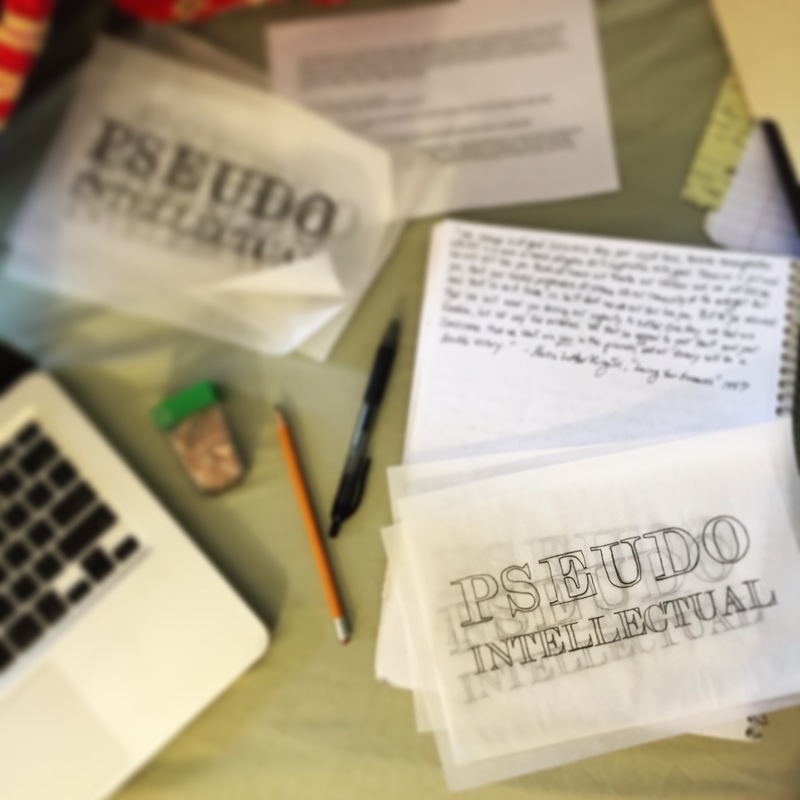 I ’m spending the coming weeks gearing up for graduate school applications, but I hope to find some time to work on a new project I’m calling, “Pseudointellectual.” This is something I’ve spent a long time thinking about, and most excitingly, it’s something I hope to structure and flesh out through the process of making it. I have two projects that I feel are representative of what I want the “brand” to be at this point, but I have ideas for many more. My plan is to release more content first before coming to any ultimate conclusions about what the project actually means to me. If you follow the link above, you can learn more about Pseudointellectual.